Poondu Kuzhambu is always my favorite. My grandma used to make this kuzhambu monthly twice or thrice and u know I used to lick the last drop of this as it will be so tasty and yummy during my childhood days, even now also… He he he…. My grandma, used to give garlic milk to me, when I have any gastric problem. But I used to run away from her, as I dont know the medicinal goodness of garlic. So she used to prepare this Poondu kuzhambu for me. Garlic has so many benefits. It is used to prevent various diseases like, heart disease, diabetes etc, it controls the weight, controls high blood pressure, increases good cholesterol, prevents blood clotting in arteries, increases immunity etc. So do try this kuzhambu and let me know how it came for you. 1. Soak the tamarind in hot water for 10 min and extract the pulp and keep it ready. 2. In a wok or kadai, add 1 tsp oil and when it is hot add the ingredients mentioned in To Grind and sauté them well till the onions and tomato becomes soft. Switch off and allow it to cool. 3. Transfer the content to food processor and grind to a coarse paste. In the same kadai, add oil and when hot, add the mustard seeds, fenugreek seeds and Urud dal. When the seeds splutters add the curry leaves and red chilli. Fry for a min. 4. Add the chopped onions (my shallots got over, so added normal onion) and the garlic cloves. Sauté it well. Add the tomato and cook till soft. 5. Now add the ground paste. Add the chilli powder, coriander powder, turmeric powder and salt. Add the asafoetida. If needed add water. 6. Allow it to boil and add the tamarind pulp. 7. Again allow to boil. Add the jaggery to it and mix well. When the oil oozes out, from the sides, switch off the stove. 8. 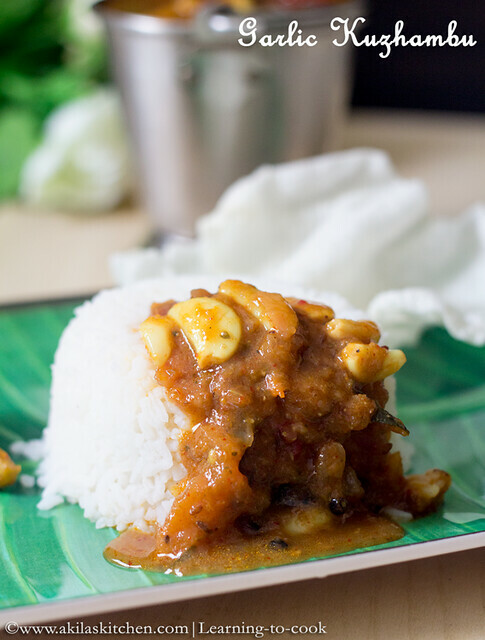 Serve the yummy poondu kuzhambu with hot rice and appalam. 1. Instead of shallots, you can use the normal onion also. But I feel, adding shallots increases the taste. 2. Jaggery level can be adjusted according to your preference. 3. Allow to boil for atleast 10 min, in medium flame. This Kuzhambu is just torturing me, so tempting and droolworthy. 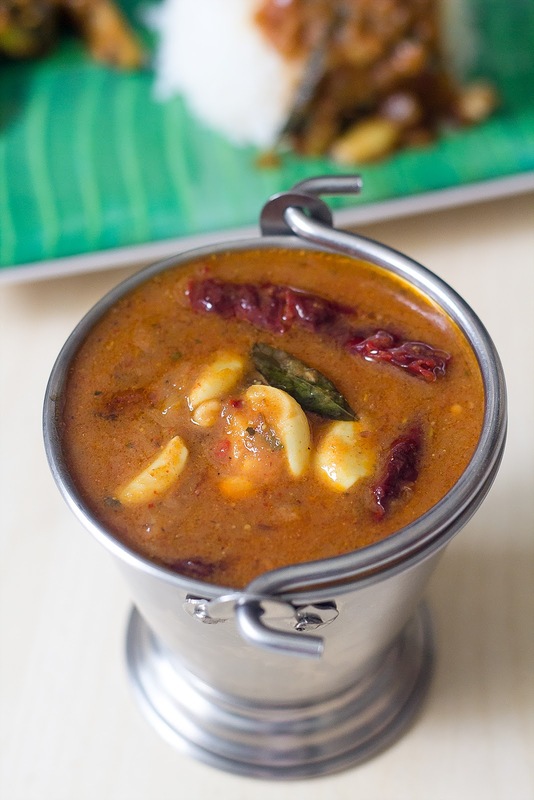 Love anything with garlic.. kuzhambu looks delicious and inviting..
Wat awesome flavours!!!!!!!!!!! 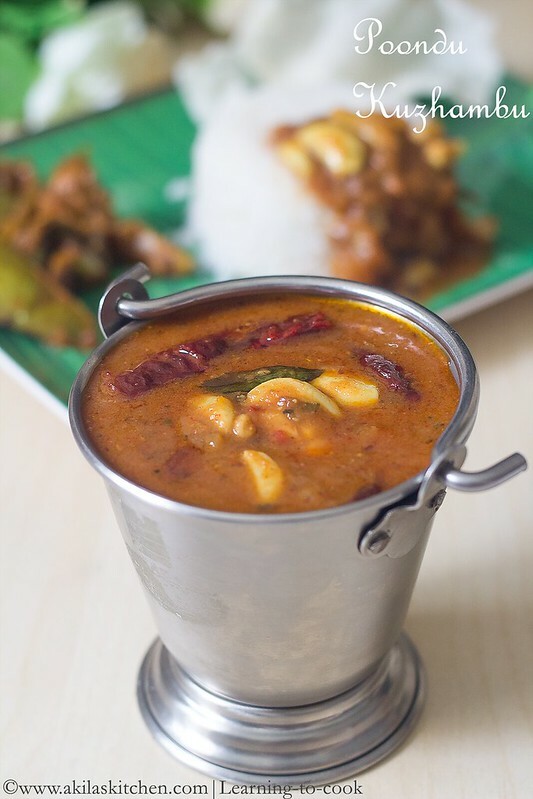 the curry looks delish…..
My favorite comfort food…looks so inviting with such lovely clicks! Thanks so much for the healthy and delicious dish. I love it and am gonna make for our vegetarian meals. my fav.. I can I have that plate?